The most important thing to remember is - simply be yourself. When choosing clothing options for your portrait there are a few things to consider. Match your clothing to the environment in which you will be photographed. Solid color clothing works best. Avoid small or bold patterns. There are really no colors that don't work, but colors do need to be matched and coordinated with each other. Also consider where your wall portrait will/may be hung, meaning the style, mood, and interior design of the room in which your wall portrait will be displayed. 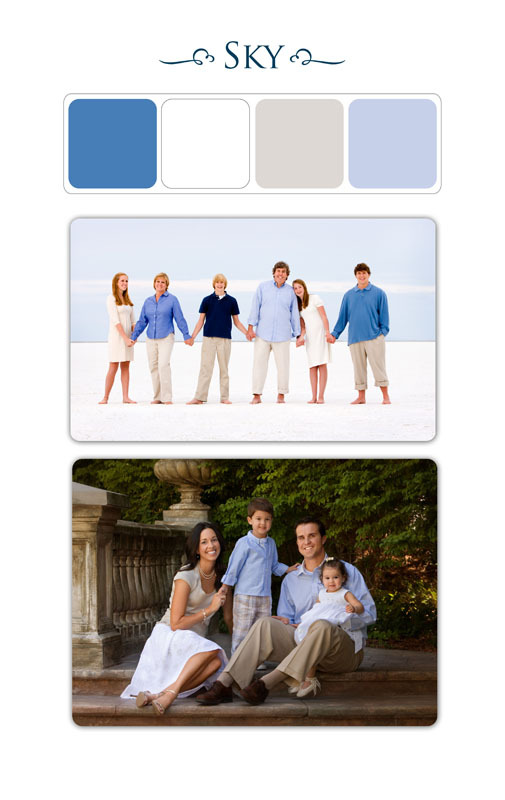 Below are a few color swatches that may help with your selection. These are only a few of endless combinations that will work. 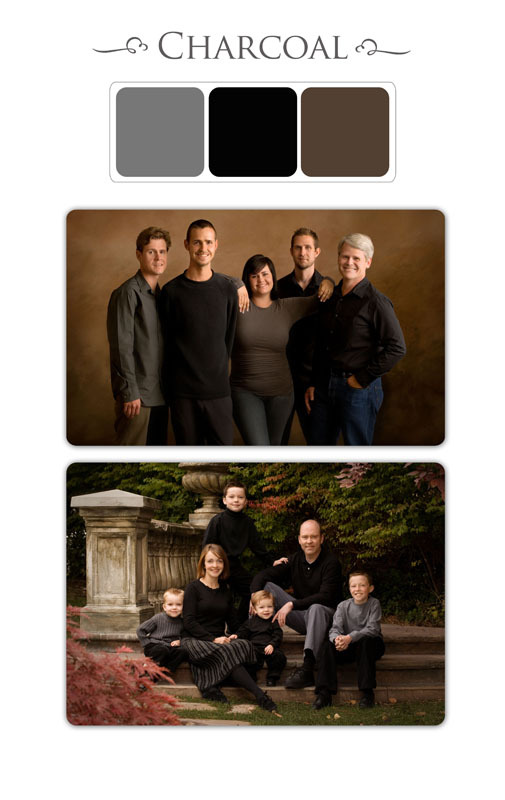 Our staff will help you with your selection and options during your portrait consultation. Also, don't forget to browse the portraits on our website for ideas. For a classic look start with solid fabrics. Add a little pattern and splashes of color with the children’s outfits and accessories on the adults (scarf, shawl, cardigan, hat, etc). Do not mix dark and light tops and bottoms. Especially in larger groups. Mixing darks and lights creates a busy look. Keeping the entire group in darker tones or all in lighter tones simplifies and draws attention to the faces. Dark clothing tends to slenderize, especially against darker backdrops. Long sleeves and dark stockings also slenderize and simplify. Sweaters and other long-sleeved knits help you look relaxed. Layered tops add depth and dimension. Jeans are great because they allow us to sit people on the ground. For outdoor portraits, autumn colors, or jewel tones work better than pastels. 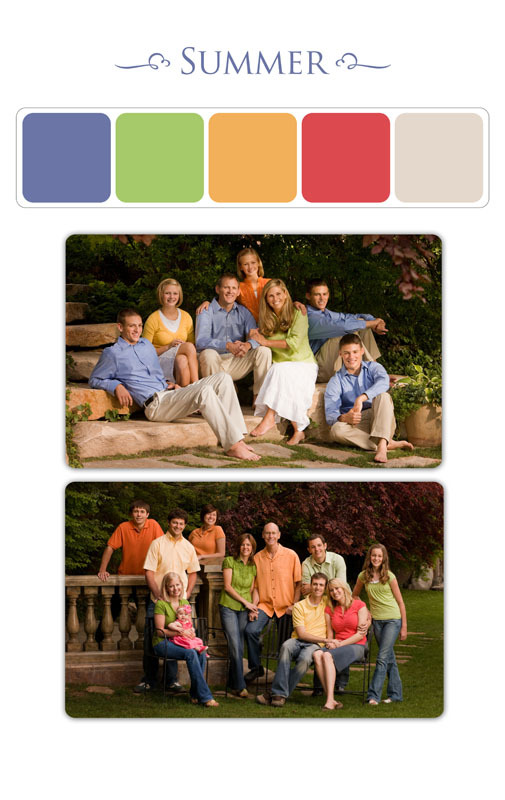 For a stunning formal portrait, start with a blend of rich, understated colors, not too “matchy”. Add a little dark-on dark pattern in accessories. Don’t be afraid to spice it up with a color splash, over-the-top fabrics, necklines and jewelry. Darker tones work well to simplify the overall look. Try this: Lay out everyone’s clothing together in the room where your portrait will live. Replace outfits and add accessories until you achieve a fresh and exciting look for that room.